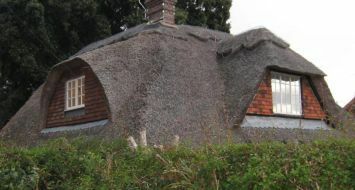 There are over 24000 listed buildings that are thatched in England. From perhaps being the most common form of roofing in the medieval, it now only makes up only 6% of the roofing of all historic buildings and was being replaced by other roofing materials from the 12th century. It is however one of the most iconic symbols of historic buildings in England. There is an ongoing debate the use of water reed, combed wheat reed and long straw. Long straw was the most common form of thatching historically, but the use of combed wheat reed and in particular water reed have expanded outside their historic geographical areas. Thatcher: Award winning Independent Master Thatchers undertaking all types and scale of Thatching work, providing impartial & qualified expert opinion. Specialising in Professional Services and acting as an expert in dispute resolution and litigation.